Precision Servive & Pumps provides a vital service to water system managers whose infrastructure component list includes concrete, steel, fiberglass or wood stave reservoirs. Managers recognize the need to periodically clean and disinfect these facilities, however, the cost to "gear up" and have all the expertise and safety equipment for working in "confined spaces", is cost prohibitive. Precision can come in with all the necessary safety equipment and expertise to complete the cleaning and disinfection of any of these facilities in an efficient, and cost-effective manner. 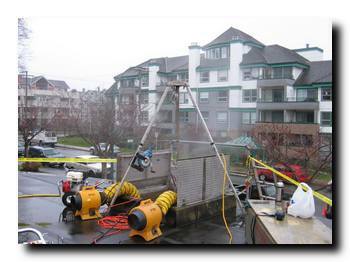 Reservoir and Storage Tank Cleaning and Sterilization is another specialty service we offer our clients. Our company has on hand and maintains all of the special safety equipment required for work in "confined spaces," as required by Worksafe BC and other Federal, Provincial and Municipal jurisdictions. The equipment includes Self Contained Breathing Apparatus, Air quality monitors, safety harnesses, other fall protection devices, emergency locators as well as air circulation and exhaust fans, generators and modified pressure washers. Our crews are fully trained and retrained annually in the use and application of all special safety equipment and the specific procedures utlized when working in and around confined spaces. To learn more about Reservoir and Tank Cleaning, click the link below. 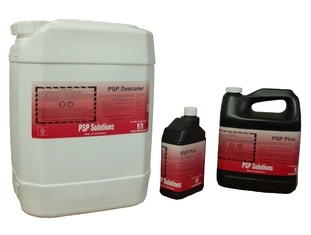 In September of 2010, Precision Service & Pumps Inc introduced the first two sku's of their line of liquefied biodegradable cleaning and disaffection compounds in Western Canada under the name of PSP Descaler and PSP Plus. The innovative combination of bio-degradable materials manufactured and packaged in British Columbia were specifically engineered for the cleaning, disinfecting and regeneration of potable water wells, delivery systems, and storage containers. PSP Descaler and PSP Plushas proven to be very effective in cleaning surfaces predisposed to heavy iron or manganese deposits, bacterial slime and other types of micro-organisms found in potable water systems.